Android 4.2 Still-Jelly Bean is pretty sweet. You've got your Photo Sphere Camera, you've got your Gesture Keyboard. But there's one thing you might notice is missing. 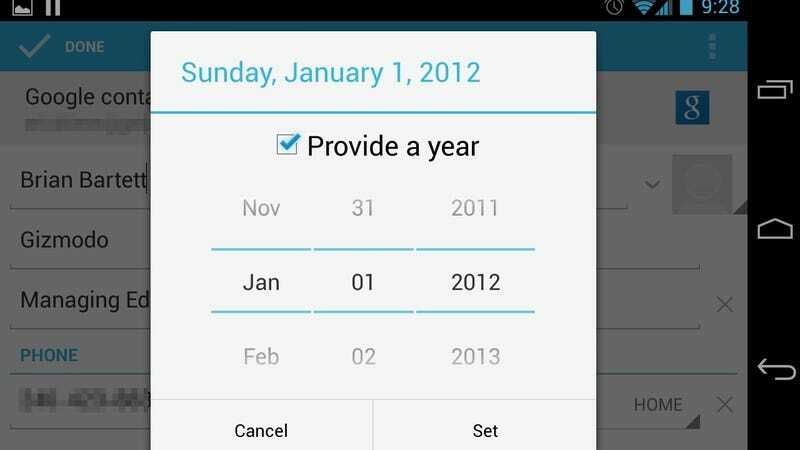 Android Jelly Bean 4.2 doesn't know what December is. Now that glaring absence isn't everywhere. Google Calender is still fine, for instance. The problem lies chiefly in the People app, where all important dates that fall during the month of December will be ignored because, you know, December doesn't exist. We've verified its absence there on the 4, the 7, and the 10, so it's a universal Nexus problem. With an omission this obvious and glaring (now that it's been found) you can bet an update to fix it will be coming in soon. In the meantime, fellow Android users, we are living in a world without Christmas. Somewhere the Grinch is dancing with his Nexus 4. If it's in the built-in People app, it's bound to show up elsewhere as well. Drop any of your own missing December sightings in the comments.